Had To Be Ivory, under jockey Tony Phillips, was the winner of the $20,617(US) John Deere Ajax Juvenile Challenge Sunday afternoon at Ajax Downs. AJAX, ONT�JULY 9, 2017�Had To Be Ivory kept his record a perfect 2-for-2 after defeating Carneros by a neck in the $20,617(US) John Deere Ajax Juvenile Challenge Sunday afternoon at Ajax Downs. Silky Senator finished another neck back in the blanket finish to get third. Under a confident ride by jockey Tony Phillips, Had To Be Ivory completed the 350 yards in :17.990, with a 7 mph tailwind, pocket the winners' purse of $9,483(US). The bay gelding posted the second fastest time in the June 18th trials and has now earned $12,825. Bryn Robertson conditions the son of multiple stakes sire IVORY JAMES for owners Carol and Jaime Robertson. 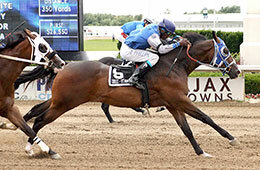 The Ontario homebred is out of Had To Be Fandango by Hadtobenuts. The win for Had To Be Ivory also earned the gelding a starting spot in the $130,000 Guaranteed John Deere Juvenile Challenge Championship(G2) October 14th at Prairie Meadows. Trainer Jason Pascoe saddled runner-up Carneros for owner Milena Kwiecien. Stone Chase Stables bred the son of champion Prospect To The Top in Oklahoma from the Valiant Hero mare Cakebread And Thou. Still a maiden from five starts, the brown colt picked up $4,123(US) for the effort. Ridden by Rene Gutierrez, Carneros has banked $6,517 this year. Silky Senator, a daughter of multiple stakes sire Louisiana Senator, races for owner Amelie Aubut. Also trained by Pascoe, the bay filly was ridden by Ramiro Castillo. Charles Robinson red Silky Senator in Oklahoma from the Royal Quick Dash mare Denali Peak. She earned $2,655. Miss Racy Eagle, Zoomn Blue, Island Vodka and Lethal Pyc completed the field. Fastest qualifier Express Your Desire along with Azoomin Fury and Diane Dynamite was scratched.